Petra je napušteni grad na području današnjeg Jordana, a u vrijeme antike je bio glavni grad Nabatejaca. Poznata je upravo po svojim helenističkim građevinama uklesanim u stijene, ali i vodovodnom sustavu, koji su otkriveni zapadu tek 1812. godine. God. 1985., Petra je upisana na UNESCO-v popis mjesta svjetske baštine u Aziji i Oceaniji kao "jedno od najvrijednijih kulturnih dobara baštine čovječanstva". Danas se Petra smatra jednom od najvećih znamenitosti Bliskog istoka, i najveća je turistička atrakcija Jordana. Godine 2007., odabrana je i kao jedno od "novih" sedam svjetskih čuda. Petra se nalazi na pola puta od zaljeva Akaba prema Mrtvom moru na visini od 800 pa do 1.350 m iznad razine mora u širokoj kotlini u brdskom području Edoma. Zahvaljujući strateški povoljnom položaju na raskrižju više karavanskih puteva koji su spajali Egipat sa Sirijom i južnu Arabiju sa Sredozemljem, grad je u razdoblju od 5. stoljeća p.n.e. pa do 3. stoljeća naše ere bio vrlo važno trgovačko središte. Petra je naročito kontrolirala raskrižje na putu tamjana. Taj prastari trgovački put vodio je od Jemena duž zapadne obale Arabije, a kod Petre se račvao na sjeverozapadni odvojak prema Gazi i drugi koji je smjerom prema sjeveroistoku išao do Damaska. Pored povoljnog geografskog položaja, imala je i dobro skriveni položaj među strmim stjenovitim zidovima okolnih bregova i, što je bilo posebno važno, sigurnu opskrbu vodom. I danas se do mjesta može doći samo uskom brdskom stazom sa sjeverozapada ili jednim stjenovitim klancem s istoka koji je dug oko 1,5 km a stijene između kojih se provlači dosižu visinu od oko 200 m dok je na najužem mjestu širok samo 2 m. Duž jednog stjenovitog zida klanca uklesan je žlijeb pokriven kamenim pločama kojim su Nabatejci dovodili u Petru vodu iz jednog brdskog potoka. Sačuvano je oko 800 građevina. Obilježeni su nabatejskim, grčko-helenističkim i rimskim uticajima. Vrlo često se na samo jednom spomeniku mogu očitati stilski elementi sve tri kulture. Riznica: Na izlasku iz kanjona koji s istočne strane ulazi u kotlinu Petre, nailazi se ravno na vjerojatno najpoznatiju građevinu Petre, Khazne al-Firaun. Izraz "građevina" i nje najtačniji, jer se kod očuvanih objekata u Petri ne radi o građenim spomenicima, nego o objektima koji su uklesani u žive stijene. Beduini su ju nazivali "Faraonska riznica", iako se ustvari radi o jednom od mnogih u stijenu uklesanih grobnica. Nije dokazano kad je rađena. Neki naučnici smatraju da je rađena u 1. stoljeću p.n.e., dok drugi vjeruju da je iz 2. stoljeća nove ere, iz vremena cara Hadrijana. Grobovi u kraljevskoj stijeni: Sjeverno od amfiteatra izdiže se tzv. kraljevski zid. Na oko pola visine stijene isklesano je više monumentalnih grobnica jedna do druge. Prepoznaju se nabatejski, grčki i rimski uticaji. Ed-Deir, grobnica u stijeni: Na izlasku s područja nekadašnjeg grada, nalazi se možda najljepši spomenik ove izgubljene kulture, El-Deir. U prijevodu, ovo ime znači "samostan". Vjerojatno zato, jer su u srednjem vijeku ovdje boravili redovnici. Nije skriven, leži visoko na brijegu i impresivan je ne samo zbog svoje veličine. Samo urna na vrhu ukrasnog okruglog hrama nad ulazom je visoka 9 m. Zbog njegovog jednostavnog ali monumentalnog stila, Ed-Deir se smatra jednim od vrhunaca nabatejske kulture. 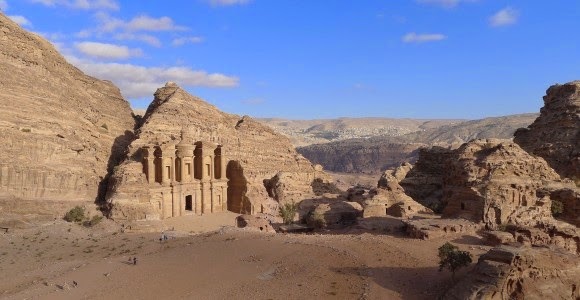 Petra is a ghost town in present-day Jordan, in antiquity was the capital Nabatejaca. Celebrity is very proud of its Hellenistic buildings carved into the rock, and water supply system, which have been discovered west until 1812. God. 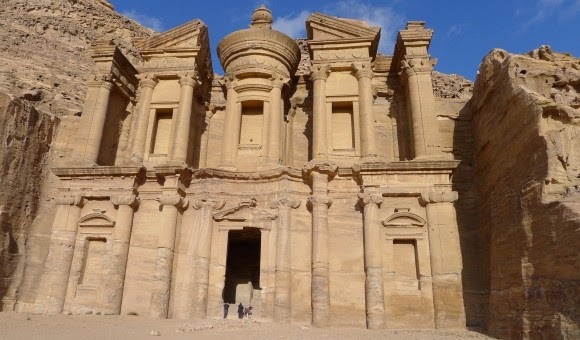 In 1985, Petra was inscribed on the UNESCO list of World Heritage Sites in Asia and Oceania as "one of the most valuable cultural assets Heritage of Humanity". Today, Petra is considered one of the greatest attractions of the Middle East, and is the biggest tourist attraction of Jordan. Year. 2007, and was selected as one of the "new" seven wonders of the world. 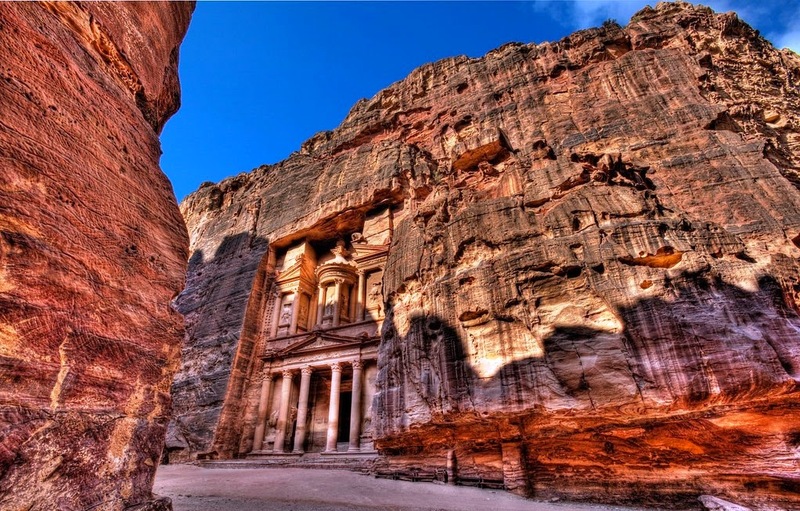 Petra is located half way from the Gulf of Aqaba to the Dead Sea at an altitude of 800 up to 1350 m above sea level in a wide valley in the hilly region of Edom. Thanks to strategically favorable location at the intersection of caravan routes that used to connect Egypt with Syria and southern Arabia with the Mediterranean, the city is in the period of the fifth century BC until the third century AD was a very important trading center. Peter is particularly controlled intersection on the way of incense. The ancient trade route led from Yemen along the western coast of Arabia, and in Peter forked the northwestern branch to Gaza and others who went to the northeast direction to Damascus. In addition to the favorable geographical position, had a well-concealed position among the steep rocky walls of the surrounding hills and, which was especially important, safe supply of water. And now to the place can be reached only a narrow mountain trail from the northwest or rocky gorge, one from the east, which is about 1.5 km and the rocks between which tries reach a height of 200 meters while the narrowest point only 2 m wide. Along one wall of a rocky gorge carved a groove covered with stone slabs which are Nabataeans brought in Peter water from a mountain stream. 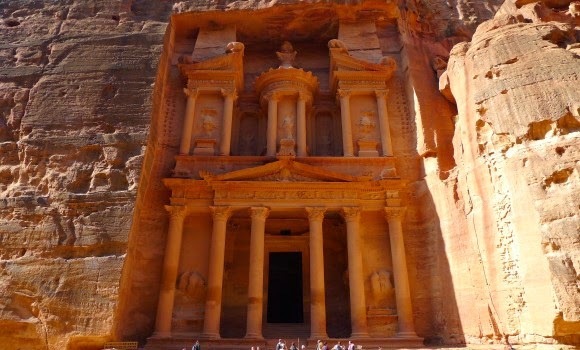 All this seemed to Petra attractive by offering security caravans from the south of Arabia who transmitted mostly expensive goods: spices and silk from India, ivory from Africa, pearls from the Red Sea and incense from southern Arabia. The resin from the trees of frankincense plant (Boswellia Sacra) was all over the ancient world highly valued as a precious sacrifice to the gods, but also as a medicine. 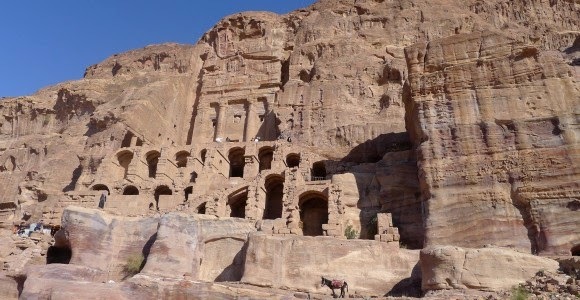 Customs and commission trade brought the Nabateans very high revenues. 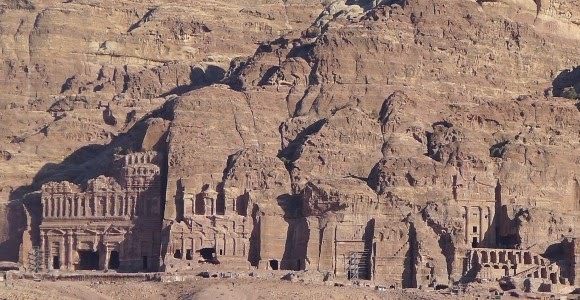 From the time of the Crusaders until 1812 none of Europeans was in Petra. Around 1800 and more are just some scientists by reputation sensed that somewhere in the Middle East could be one legendary city carved into the rocks. Again, it is for Europeans discovered the Swiss Burckhardt traveling around Arabia. More than 100 years later, Thomas Edward Lawrence (better known as "Lawrence of Arabia"), writes in his book "Seven Pillars of Wisdom": "Peter is the most beautiful place in the world." He thought that every description of faded before our own experience in the encounter with Petra. Its saved about 800 buildings. Tokens are Nabatean, Greek-Hellenistic and Roman influences. Very often the only one monument can be read stylistic elements of all three cultures. Treasury: At the exit from the canyon to the east side enters the valley of Petra, finds it straight to probably the most famous building Petra, Khaznah al-Firaun. 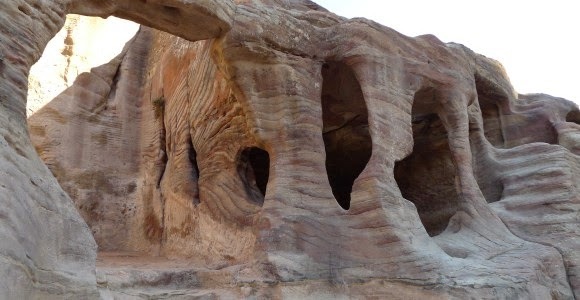 The term "structure" and her most accurate, because the preserved buildings in the Petra not a constructed monuments, but the facilities that are carved into the living rock. Bedouins called her "Pharaonic treasure trove", although in reality the one of the many carved into the rock tomb. It is not proven when he was done. Some scientists believe that it was done in the first century BC, while others believe it is from the 2nd century AD, from the time of Emperor Hadrian. 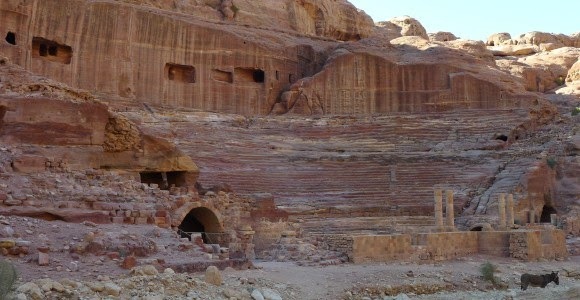 Roman Theatre: On the way from entering the valley towards the center of Petra, on the left is quite well preserved amphitheater from the first century. He, as well as other buildings, carved out of the rock. There are 33 rows of seats, and had about 5,000 places. When carving an amphitheater, outdoor approached a number of graves that had earlier been carved into the rocks. Amphitheatre American archaeologists have discovered in 1961. 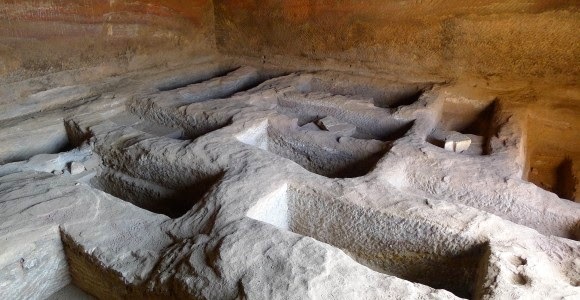 The tombs in the royal rock: the north of the amphitheater rises so. Royal wall. At about half the height of the rock carving of a more monumental graves next to each other. 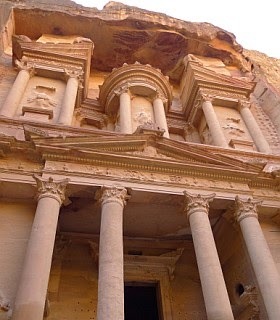 They recognize the Nabatean, Greek and Roman influences. Ed-Deir, tombs in the rock: At the exit from the territory of the former city, is perhaps the most beautiful monument of this lost culture, El-Deir. In translation, this name means "monastery". Probably because, as in the Middle Ages, monks lived here. It is not hidden, perched high on a hill and is impressive not only because of its size. Only urn on top of a decorative circular temple over the entrance is high 9 m. Due to its simple but monumental style, Ed-Deir is considered one of the highlights of Nabatean culture.